Bradford L. Treusch has received the highest legal rating from the Martindale-Hubbell Law Directory for over thirty years, indicative of the firm's adherence to professional standards of ethics and exceptional legal ability. We are recognized for our expertise, experience, and effective case resolution. At the Law Offices of Bradford L. Treusch, we are committed to providing our clients with legal services of the highest quality and integrity in an efficient and cost-effective manner. Our clients are given personal attention, and are provided with creative solutions to their unique and challenging legal problems. Bradford L. Treusch has an excellent reputation among his peers and in the community. We are driven by excellence and professional integrity in every task undertaken. 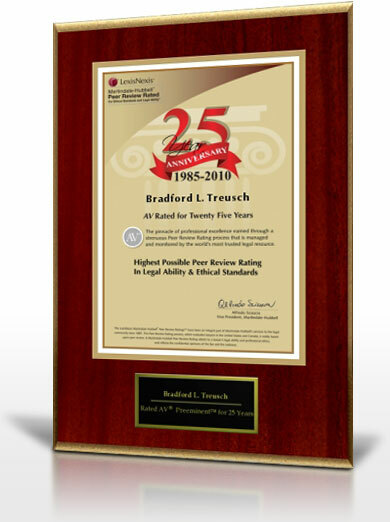 The Law Offices of Bradford L. Treusch specializes in family law and personal injury litigation. The firm represents individuals involved in legal proceedings stemming from marriage dissolutions, counseling clients on the division of marital property, tax issues, child and spousal support, child custody and paternity. The firm also represents individuals who have been seriously injured as a result of the negligence of another. We understand that facing any legal issue, whether it is a family law/divorce matter, an automobile accident, personal injury, or real estate related matter, involves difficult and complicated decision-making. If you, a friend, or a loved one is in need of legal assistance, please feel free to contact us for an informative consultation. We are conveniently located in Beverly Hills. The information contained in this site has been prepared by the Law Offices of Bradford L. Treusch and is not intended to be legal advice. Copyright © 2012 by the Law Offices Of Bradford L. Treusch. All Rights Reserved.